Of all the days of the year, Tax Day is probably the one in which you could most use a break. And while taxes generally are not that fun, there is some good news amid the tax return blues. Some nationwide chains are offering Tax Day "freebies," deals and discounts to take the sting out of preparing those returns. Below is an explanation of why tax day is April 17 this year, and a list of freebies and deals for the day and beyond. When is tax day 2018? April 15 is Tax Day most years, but since April 15 was on Sunday and Monday is Emancipation Day in Washington D.C. so federal employees are off, Tax Day falls on Tuesday. Emancipation Day marks the day the Compensated Emancipation Act was signed by President Abraham Lincoln. The act signaled the end of slavery in the city of Washington. Tax Day means it’s the last day to file your 2017 taxes unless you file for an extension. Here’s a list of freebies and deals available Tuesday. Applebee's: It’s "Dollarita" time at Applebee’s. Get $1 margaritas through April 30. BJ’s Restaurant & Brewhouse: You can celebrate making it through Tax Day by getting a free Pizookie with a minimum purchase of $9.95 on Wednesday. Babbo Italian Eatery: Get an 8-inch pizza for $4.17 on Tuesday when you purchase a drink. Mention the Tax Day special. Boston Market: Get a half chicken individual meal with two sides, cornbread and drink for $10.40 Tax Day Tuesday. Bruegger’s Bagels: Get the Big Bagel Bundle for $10.40 when you sign up for a coupon here. California Tortilla: Get a free order of small chips and queso with any purchase Tuesday. You have to say "chipping in." Capriotti’s Sandwich Shop: Get a free "upgrade" on small or medium sandwiches on Tuesday. Mention the Tax Day deal. Captain D's: Get the $10.40 deal on Monday and Tuesday. The deal includes six pieces of its signature batter-dipped fish, one family side and six pups. Chili’s: Get a $5 Cuervo Blue Margarita at participating locations on Tuesday. Chuck E. Cheese’s: Buy a large cheese pizza Tuesday through Thursday, get one large cheese pizza free. Cicis: With a coupon get an adult buffet for $4.17 Tuesday. Corner Bakery Café: Tuesday through Thursday you can mix and match two breakfast, lunch or dinner items for $10.40 at participating locations. Great American Cookies: Get a free Cookies & Cream Cookie Tuesday at participating locations. No purchase is necessary. Farmer Boys: On Tuesday, you can get two Breakfast Burritos or two "Bell Ringer Double Cheeseburgers" for $10.40 at participating locations. Fired Pie: Get any one-topping pizza for $4.17 with the purchase of a beverage or take $2 off any custom pizza or salad with a beverage purchase Tuesday. These deals are only valid in restaurants. 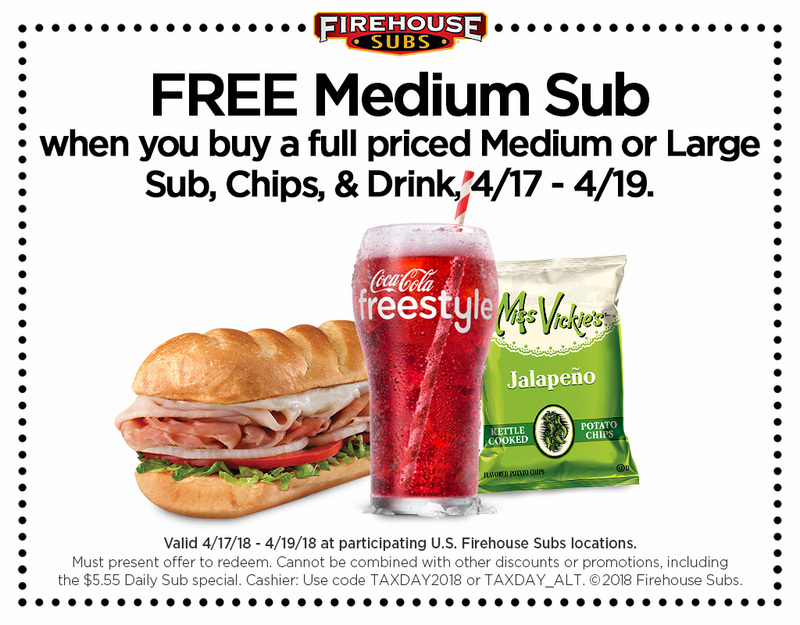 Firehouse Subs: Use this coupon for a free medium sub with purchase of a full-price medium or large sub, chips and a drink Tuesday through Thursday. Firenza Pizza: Get any one-topping pizza for $4.17 with the purchase of a drink Tuesday. Grimaldi’s Pizzeria: Get a 16-inch cheese pizza for $10.40 Tuesday. Hardee’s: Get a free sausage biscuits from 7 to 10 a.m. Tuesday at participating locations. Say "made from scratch," when ordering. Hot Dog on a Stick: Get a free Original Turkey Dog or Veggie Dog on Tuesday. No purchase is necessary. Hooters: Through Tuesday, kids 12 and younger get a free kids meal with an adult purchase of $10 or more. Hungry Howie’s: Get a medium one-topping pizza for 15 cents with the purchase of a large one-topping pizza at regular price on Tuesday. Use promo code 18TAXDAY. This deal is for online carryout orders at participating locations. The offer is not valid in Florida. Kings Dining & Entertainment: Kids 18 and younger will get a free bowl from 3-9 p.m. Tuesday. Kona Ice: It’s Kona Ice’s "Chill Out" Day. Look for the Kona truck during certain hours on Tuesday to get a free cup of tropical shaved ice. Click here to find participating locations and hours. Office Depot: Get up to five pounds of documents shredded free through April 28 at Office Max and Office Depot. Use this coupon. P.F. Chang's: Get 15 percent off takeout orders Monday and Tuesday. Use the promo code TAXDAY for online orders and phone orders. Piada Italian Street Food: Piada is offering free blackberry lemonades at all locations Tuesday. Pollo Tropical: Get 17 percent off regular menu platters Tuesday at participating locations. Potbelly Sandwich Shop: The first 75,000 people to sign up for the Potbelly Perks loyalty program will get a free sandwich. If you are already a member, you can get a buy-one-get-one-free sandwich offer loaded to your account Tuesday. Quiznos: New and existing Toasty Points loyalty members get 10.40 percent off any purchase Tuesday. RA Sushi: Buy one regular-price drink and get a second one for $1 Tuesday. Schlotzsky’s: Tuesday get a free small original sandwich with the purchase of chips and a medium drink. Sonic Drive-In: Get up to five half-price cheeseburgers Tuesday at participating locations. Sonny’s BBQ: Sonny’s has an IRS — Irresistible Ribs Special — deal Tuesday with half-price Sweet & Smokey or House Dry-Rubbed Rib dinners. The deal is good for dine-in and takeout. No coupon is needed. Staples: Get a pound of documents shredded for free at Staples through April 21. Use this coupon. White Castle: Through Tuesday, get 15 percent off any in-restaurant White Castle purchase. Are you a victim of tax-related ID theft? Here’s what to do.